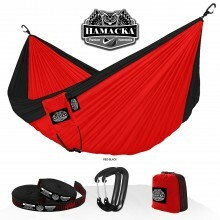 Travel hammocks are perfect for being on the road and you lie best in them diagonally. 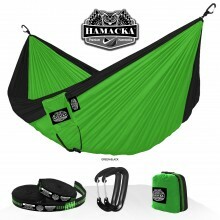 In this position, your back is straight and the hammock is opened by the body. The wider the hammock, the bigger the lying comfort! Thanks to the suspension system, our travel hammocks are suspended and demounted in no time. TRAVEL HAMMOCK SET HAMACKA (DARK BLUE-BLACK) The Travel Hammock Set Hamacka has a meticulously th..
TRAVEL HAMMOCK SET HAMACKA (GREEN-BLACK) The Travel Hammock Set Hamacka has a meticulously though..
TRAVEL HAMMOCK SET HAMACKA (PINK-BLACK) The Travel Hammock Set Hamacka has a meticulously thought..
TRAVEL HAMMOCK SET HAMACKA (RED-BLACK) The Travel Hammock Set Hamacka has a meticulously thought-..
TRAVEL HAMMOCK SET HAMACKA (TANGERINE-BLACK) The Travel Hammock Set Hamacka has a meticulously th..
TRAVEL HAMMOCK SET HAMACKA (TURQUOISE-BLACK) The Travel Hammock Set Hamacka has a meticulously th..
Go with the flow! 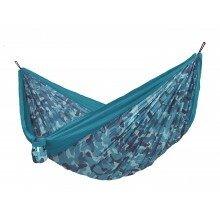 The Colibri Camo River is for those who are at home in, or on the water. The color..